It's Monday and that means, not only the start of another week (where are they disappearing to?) but also it's Crafting Buddies day where we can share pictures and stories of our furred, feathered or scaly friends "helping" us to create! Pop over to http://craftingpets.blogspot.com/ to check out Joanne's site, see other little helpers or post a link to your own stories and pictures. So, here is my best ever crafting buddy, Cherry. Some of you will know that Cherry died in 2004 (can't quite believe it is so long ago now) so this picture is quite an old one and taken on my old, pre-digital camera - I've scanned these pictures in, so please excuse the poor quality. All of these images bring a mixture of emotions and memories flooding in, some that make me smile or laugh, and others that make me feel sad and tearful. The tears are the price we pay, of course, for embarking on a relationship with an animal...but they are a small price to pay for all that we gain in return. So, here is Cherry, "helping" me by sitting plumb in the middle of my work table and deciding that I had done "quite enough for today thank you very much, now would you please concentrate on me again"! I can tell how many years ago this was taken as I can see that I have glass painting bits and pieces on the table - that dates it! 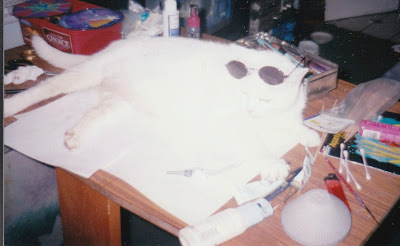 It was obviously Summer too, as Cherry has my sunglasses perched on her head! It also reminds me of the time when I was working on an oil painting and Cherry was perched nearby, asleep. Cherry had epilepsy and, most often, her fitting came on whilst she was sleeping (as she grew older her fits got worse and she would sometimes have them whilst she was awake, which was much more distressing). Well, this day, she suddenly fitted and fell onto my pallette. Even though I moved fast, given that it can be tricky to lift an animal that is thrashing about, she was covered in every colour imaginable within a second or two. A call to the vet's told us to clean her fur with Swarfega and then rinse her off as best we could. Poor Cherry, she looked a sorry state for days after that, and she must have been the most colourful cat ever. Despite her condition, she was a tough little cookie! She was nervous with everyone except me and David, and we could do anything with her. She didn't worry about anything else as long as she had cuddles, love and food - especially crunchies! The most loving little character we have ever known, so gentle and sweet. I can recall, looking at this picture, the time where she sat on the floor beside my table, waiting patiently for me to finish so that she could snuggle up on the sofa with me....I moved my chair slightly and Cherry started to walk away. Oddly though, she only walked a step and then stopped abruptly. She moved again, made a little squeaking noise and then walked off. I looked down and saw a clump of white hairs under the leg of my chair! I had inadvertently caught the hairs on the tip of her tail and Cherry just tugged her tail out and left some fur behind! She was never one to complain! I have a feeling that, looking at this next picture, she had just been indulged with a few crunchies....Cherry lips! 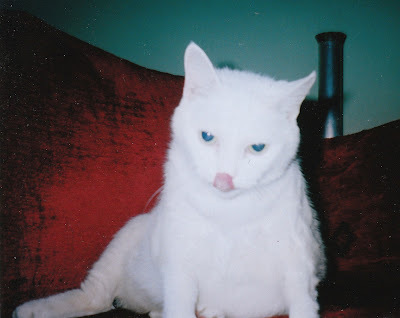 She really was a beautiful girl with her pure white fluffy coat, pink nose and lime yellow eyes. Even people who weren't fond of cats fell for Cherry. She even had her moment of fame in Hobbycraft! Years ago I used to demonstrate in their Stockport store as well as teaching workshops and hosting their childrens craft parties. I also helped when they were making the large design boards to go above their products. So I'd make up a board with samples of the products beneath as well as making something to show what could be done with them. 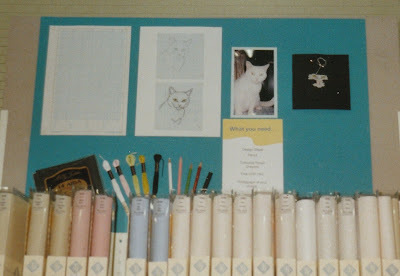 When it came to the board for the Aida fabric and silk threads, I decided I'd do something a little different, and I did a display to show how you could make your own cross stitch pattern form a photograph using graph paper. I used black Aida and made my pattern from a photo of Cherry. I worked part of the design with embroidery threads as you can see in this picture. It was lovely to walk into the store and see Cherry looking out from that board! Of course, my "Cherry the cat" stamps were based on, and were my tribute to, her. The last picture I'd like to share with you is a very special one to me. In 2002 Cherry disappeared not once, not twice, but three times! The first time we lost her for a week and, eventually, one of our posters led to someone ringing to say they had seen her in their garden a day or two before. We found her nearby and thought that was the end of her adventures. Cherry would go from being content to stay inside for a week or two, and then she would want to go out and about for a day, sometimes coming back in the early hours. She usually came when I called her, or a two tone whistle would bring her running towards me with her characteristic slightly sideways gait and her tail curled like a question mark! Sometimes she liked to ignore me and stay out, but not that often. She also came with us when we went over to housesit for mum and dad while they were on their annual hols. We'd enjoy the house for a fortnight and Cherry loved it there with a nice garden to enjoy, fields to explore (the horses didn't faze her!) and a conservatory to lie in. I had to put sunscreen on her ears with her being white! We never had a problem with her when we were there, she knew where we "lived" and she loved it. 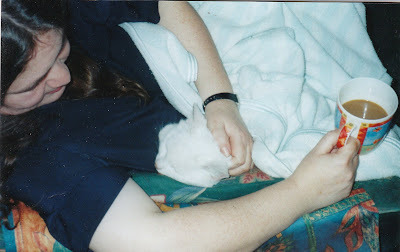 However, in 2002, she went out on the first day we arrived, for her usual exploratory walkabout, just to see if everything was as it was last time etc. This time though, she just didn't come back. We spent the whole fortnight searching, calling, putting up posters. Mum and dad came back and we had to come home without Cherry - it was terrible. A few days later, mum rang to say that someone had rung and thought they had seen her. We raced over and met the lady at a church where she had been seen. There was a little "tunnel" at the base of the church and, as soon as I called her, Cherry came running out! She had been hiding in there, kept fed on crumbs of sandwiches by the local children who had spotted her. She was quite some way from the house and we decided that she had followed a railway embankment that led to where the church was. That, we thought, must be the end of her adventures! Oh no. In the Winter of the same year, she disappeared again! This time she was missing for three weeks, and I had just about given up hope. David spent every second he could walking and driving around, calling her and searching everywhere he could think. This time the posters brought no calls. I would go in a different direction every evening, calling and whistling. On the 18th December (I remember it so well) David picked me up from Hobbycraft where I had been demonstrating that day. I recall that he got cross with me because I was saying that she must have been run over or something equally awful. We decided to go looking again before we went home. We went down a road that backs onto a local MacDonald's - you can always smell the chips near there! There are lots of apartments down there. We drove down there with the windows open and I was whistling for her. Suddenly we both saw a flash of white near a low wall. We hardly dared to believe our eyes but I was out of the car like a shot and there she was...walking out from the driveway of some flats. She was shouting the whole time, I was crying and calling her name. She was so beside herself that she just kept walking along, me walking after her, her carrying on walking. I stopped walking, called her and she came charging to me. I whisked her up and got in the car and we drove home. I can still recall exactly how that moment felt....it was overwhelming. So the last photo is from that night, about ten minutes after we got home. Cherry was mucky, thin and smelly but she looked the most beautiful thing I had ever seen. She had a good drink, some food and then I snuggled her up, as you can see. Her purrs were the loudest I have ever heard from any cat - ever! You can imagine how ecstatic she was to be snug and warm and home after three weeks on the streets in December! We realised that the epilepsy had damaged Cherry's homing instincts, so, unfortunately, she spent her last two years as a mostly indoor cat. Having always enjoyed her time outside, Cherry really missed her previous lifestyle, and it always saddens me to think that her last two years weren't as happy. But we gave her a good life. She had obviously been thrown out by her previous owner because of the difficulties having an epileptic cat involves. She found us and she knew we were the ones. That was it. No going back, we belonged to her. How true, and how wonderful. Ah I have tears running down my face now. What a touching tale. Cherry is so sweet. My she is whiter than snow. Gorjuss Puss. I love my Cherry Cat stamps and have to say that are still my favourites.